The worldwide trade in bumblebees can lead to the spread of diseases, which in turn has been claimed as a factor in bumblebee decline. Populations of the introduced Bombus terrestris, which invaded NW Patagonia, Argentina, in 2006, harbor the highly pathogenic protozoan Apicystis bombi. We asked whether A. bombi had been co-introduced with B. terrestris, and if so, whether spillover occurred to the two resident bumblebee species in the region: the introduced European Bombus ruderatus and the native Bombus dahlbomii. We searched for A. bombi by means of PCR in samples of B. ruderatus and B. dahlbomii collected before and after the invasion of B. terrestris and in samples of the latter. We found no A. bombi in samples of B. ruderatus and B. dahlbomii collected before B. terrestris invasion, whereas post invasion, A. bombi was present in all 3 species. The identity of the parasite was established by sequencing the 18S region, which was identical for the three bumblebee species and also matched the European sequence, confirming it to be A. bombi. This is the first report of A. bombi in B. ruderatus and B. dahlbomii. Moreover, our results suggest that Patagonia had been free of A. bombi until this parasite was co-introduced with B. terrestris, and spilled over in situ to these two previously resident species. 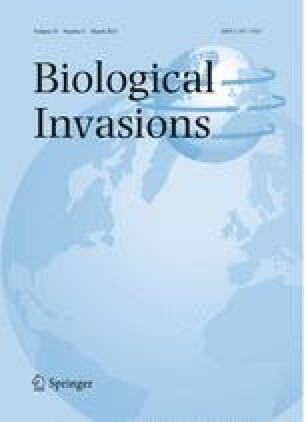 Finally, our findings provide indirect circumstantial evidence of a potential link between the population collapse and geographic retraction of B. dahlbomii and the introduction of this novel parasite. The online version of this article (doi: 10.1007/s10530-012-0311-0) contains supplementary material, which is available to authorized users. We thank the National Parks Administration of Argentina (APN) staff for sampling permits and Felix Vidoz and Andres Novaro for logistics during field work. H. Lestani, M. Zorzoli, M. Sabatino, Y. Sassal, A. Saez, G. Amico and J. Paritsis kindly provided bumblebee samples. This study was partially financed by Rufford Small Grant and the Canon National Parks Science Scholars Program to CLM, and the Research Council of Ghent University (BOF-UGent), the Fund for Scientific Research-Flanders (FWO-Vlaanderen, Belgium) and the Flemish agency for Innovation by Science and Technology (IWT-Vlaanderen, Brussels). CLM and MAA are researchers at the National Research Council of Argentina (CONICET). We specially thank to D. Goulson, M. Nuñez, an anonymous reviewer and to the Editor-in-Chief D. Simberloff whose constructive comments and suggestions helped to clarify and improve this paper.